Muthathi is a lesser known destination, around 100km from Bangalore. It is located on the banks of the river Kaveri near Malavalli. A one day trip from Bangalore is enough to cover Muthathi and a few other places around. River Kaveri and Hanuman temple are the main tourist attractions in Muthathi. There is a mythology related to this place, once goddess Sita loses her nose ring while taking bath in the river. Later, Lord Hanuman finds her nose ring in this place and returns it to her. Hence, Hanuman in this place is called as 'Muthetharaya'. Here visitors can enjoy the scenery and a view of the forest ranges belonging to the Kaveri Wildlife Sanctuary. Tourists can also try coracle rides but have to be careful as it is run by the locals. However, swimming in the river should be totally avoided in Muthathi, as there are many whirls and the water current is high. It is better to enjoy the scenery and have a pleasant time on the banks of the river. Bheemeshwari Fishing Camp is yet another spot near Muthathi (2km). The town is known as the fishing hub and the river here is full of mahseer fish (game fish). So, it is called as the 'Angler's Paradise'. There is also an adventure camp where you can try some adventure sports like kayaking, ropewalking, etc. The surrounding forest area is rich in wildlife and occasionally visitors can spot some animals. Visitors have to carry their own food and water as there are not many good eateries in Muthathi or Bheemeshwari. Decent hotels are only available in Kanakapura and some eateries in Satanuru. There are a few other places to visit around Kanakapura, it can either be covered while going or coming back. Mekedatu in Kannada means 'a goat's leap', this spot is near Sangama where river Arkavathi and river Kaveri meet. Sangama and Mekedaatu are well known weekend getaways from Bangalore. Many people visit this place along with Shivanasamudra falls nearby. Shivanasamudra Falls is created by the Kaveri river and it plunges from a height of 98m. The world's first hydro-electric station was set in Shivanasamudra Falls and it is still working. Chunchi Falls is around 15km from Sangama; this small waterfalls is formed by the Arkavathi river. Tourists have to be careful during rainy season, as the rocks will be slippery. During summer the water will be low, so one can see the rocky areas clearly. A one day trip is enough to cover all these places around Muthathi. Since, it is not very far from Bangalore, this tour is going to be enjoyable. 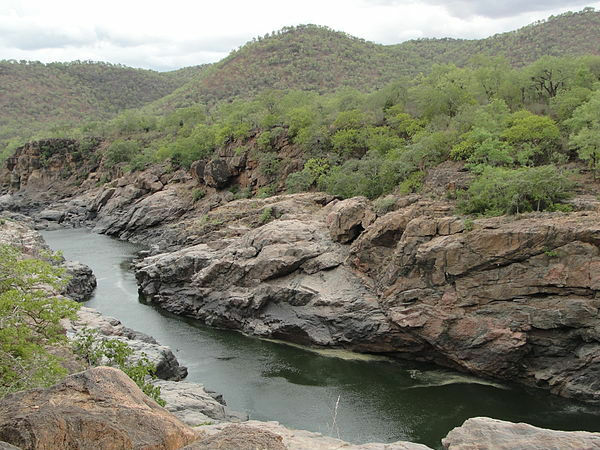 Muthathi is one of the main river banks near Bangalore and hence ideal for weekend trips.